Houston, Texas – Strong attendance marked the first “Unfinished Lives” session for Houston’s Gay Pride Month. Much-anticipated Session 2: Lessons Learned is upcoming at Resurrection Metropolitan Community Church at 6:30 pm. 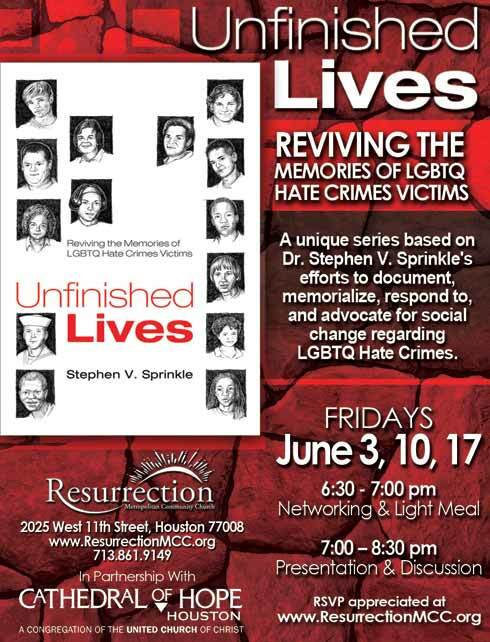 Dr. Stephen Sprinkle, author of Unfinished Lives: Reviving the Memories of LGBTQ Hate Crimes Victims, will share five life lessons the stories of hate crimes murder victims have to teach us. Among the insights Dr. Sprinkle will share in Session 2 are: Why we must learn to talk and think about anti-gay hate crime murder in a different way than ever before; How to stand with our Transgender sisters and brothers as so many are preyed upon; What makes the numbers of anti-LGBTQ hate murders spike upward, even after the enactment of the long-awaited Matthew Shepard Act. The first session, “Stories of Those We’ve Lost,” set the stage for considering violent hate crimes against the LGBTQ community in a brand new light. Dr. Sprinkle compassionately told the stories of Houston’s own Kenneth L. Cummings Jr., and Simmie/Beyoncé Williams Jr. of Fort Lauderdale, Florida, both of whom died for being gay and/or gender variant. Cummings, a 46-year-old Southwest Airlines Flight Attendant, was hunted by a religious zealot who murdered him and burned his corpse in a remote South Texas location as a “burnt offering.” Williams, a transgender teen of color, was shot to death on the day word came to her of acceptance in the Job Corps, news so exciting that she went down to the Sistrunk Avenue “Transvestite Stroll” to share with her gay family. She was shot to death by two young men who fled the scene, and are as yet unidentified. Dr. Sprinkle talked about sadness and hope in relation to both killings, and encouraged the audience to learn more about the real people behind the statistics on hate crimes. Central to his presentation was the idea that LGBTQ Hate Crimes Victims are our ancestors, portals through whom we can learn to love our lives and our queer communities better, deeper, and more fully. Rev Kristen Klein-Cechettini and Rev. Lynette Ross led the session in a meaningful, hopeful, and life-giving celebration of the lives of all hate crimes victims, represented by the fourteen stories told in Unfinished Lives. “Session 2: Lessons Learned” will pick up the theme, highlighting two more stories from Dr. Sprinkle’s ground-breaking book, and offering important insights on what the lives of gay men, lesbians, bisexuals, and transgender people really count for. From 6:30 to 7 p.m., a delicious light supper will be provided free of charge. The session will begin at 7 and conclude by 8:30 p.m. Sponsors for the series are Cathedral of Hope Houston, Transgender Foundation of America, and Resurrection MCC. Everyone is invited to add this significant experience to their Pride Month activities in Houston!